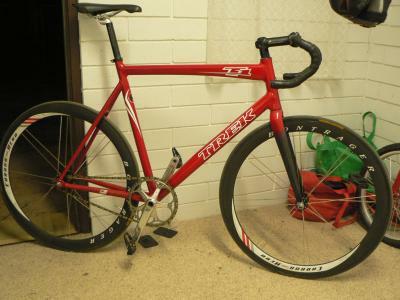 Trek T1, with Bontrager Aero Carbon wheelset. Plus original wheelset. Size 60cm. Truvativ Omnium cranks. Dura Ace 50 tooth, and Truvativ 48 tooth chain rings. 2 15 and 2 14 tooth Dura Ace sprockets. Izumi chain. Frame only ridden in one comp. Beautiful condition.